If you have a conviction, previous arrest, or charge on your criminal record, you are likely eager to erase it, if possible, so you can truly move on with your life. Having a criminal history can make it difficult to obtain employment and take advantage of certain educational opportunities, like scholarships, where a criminal background check is a requirement. Fortunately, there is a way to erase a record of a conviction or arrest in New Jersey: seeking an expungement. New Jersey law provides certain requirements for wait times before an individual is eligible to seek an expungement and places limits on the number of expungements an individual can get. On October 1, 2018, NJ laws on expungements changed to increase the number of expungements a person can have and reduce wait times for applying for an expungement. Below are some of our clients most frequently asked questions about expungements in New Jersey. If you have questions about your eligibility for an expungement or want to know more about the expungement process, contact the William C. Fay to speak with an attorney who can help. Call 609-832-3202 or send us a message to get a free consultation. How do I get a felony expunged in New Jersey? To seek an expungement for a felony conviction, or an indictable offense as it is referred to in New Jersey, you must first determine whether the conviction was for an offense that is eligible for expungement. There are several indictable offenses in New Jersey that cannot be expunged including criminal homicide, aggravated sexual assault, sexual assault, aggravated criminal sexual contact, certain forms of endangering the welfare of a child, kidnapping, luring or enticing, human trafficking, arson, robbery, terrorism, perjury, and certain drug offenses. If you have ever had a felony expunged in the past, you cannot seek an expungement for another felony conviction. Keep in mind that this only applies to felony convictions that were previously expunged, so if you had a previous felony charge that was dismissed, you can still apply for an expungement for a previous or subsequent felony conviction. As of October 1, 2018, past participation in Pre-Trial Intervention (PTI), through which a previous felony charge was dismissed, is no longer a bar for applying for expungement of a prior or subsequent conviction. The wait time for applying for expungement of a felony conviction was reduced by New Jersey’s new expungement law from 10 years down to 6 years from the date of conviction, completion of probation or parole, release from jail, or payment of fine—whichever occurs later. This means you can potentially erase a past mistake and move on with your life sooner. How do I expunge a disorderly persons offense? The process for applying for an expungement for a conviction of a disorderly persons offense is the same as that for seeking an expungement for a felony conviction, however, wait times and other requirements are different. To expunge a conviction for a disorderly persons offense you must wait 5 years from the date of conviction, completion of probation or parole, release from jail, or payment of fine—whichever occurs later. You may only apply to expunge a disorderly person conviction if you have no more than 4 disorderly persons offenses, you were convicted of multiple disorderly persons offenses that were all entered on the same day and have no other prior or subsequent convictions, or you were convicted of multiple disorderly persons offenses that were part of a crime spree, where the offenses were interdependent or closely related and were part of a sequence of events that occurred within a short period of time. Examples of common disorderly persons offenses that are expunged in New Jersey include possession of less than 50 grams of marijuana, drug paraphernalia, harassment, criminal mischief, trespassing, shoplifting, and disorderly conduct. Can I get an arrest expunged in NJ? Yes. 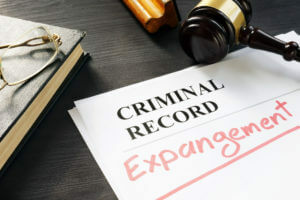 In New Jersey, if you were arrested for a criminal offense and the charges against you were dismissed outright, you can apply for expungement of the record of your arrest immediately. Can I get a DWI arrest or conviction expunged? No. DWI is a non-criminal offense in New Jersey. Only criminal arrests and convictions can be expunged, so non-criminal offenses like DWI arrests and convictions cannot be expunged from your record. What is the process for a New Jersey expungement? To apply for an expungement, you must obtain records of the arrest or conviction that you wish to have expunged. You must properly create a Petition for Expungement and have three copies notarized. Lastly, you must prepare a proposed expungement order and submit the proposed order, 3 notarized copies of your Petition for Expungement, and your conviction or arrest records to the superior court in the county where you were convicted or arrested. You must then provide proof of service to a variety of parties, including New Jersey State Police, the police department in the location of your arrest, the local municipal court, and the Prosecutor’s Office. There are a number of steps in the months that follow your initial petition being submitted and failing to complete the expungement process correctly may result in your petition being denied. This is why it is so important to have an experienced expungement attorney thoroughly executing the expungement process on your behalf. Do I need a lawyer to get an expungement in NJ? Navigating what conviction or arrest records can be expunged and how long you must wait to expunge them, as well as preparing the required documents to apply for an expungement like a Petition for Expungement and a proposed expungement order and serving them on the required parties are not simple tasks. An expungement lawyer in New Jersey can help make sure you have the best chance of getting your expungement approved. If you would like to seek an expungement for a previous conviction or arrest record, contact our firm today at 609-832-3202 and we will help you to determine if you are eligible for an expungement and assist you through the process. With several convenient offices, we serve clients in all of South Jersey, including in Burlington County, Camden County, Gloucester County, and Atlantic County.